As I promised to myself I am eating like a rational human being today. I told John to eat the rest of the pork and I would eat something vegetable based. We have plenty of veg hanging around in the refrigerator and after the always enjoyable task of cutting them up, I gave them a quick sauté, mixed the cooked ditalini in, and finish the sauce with some pasta water. The nice thing about this meal is that the leftovers can be easily mixed with some vegetable or chicken broth for lunch tomorrow! 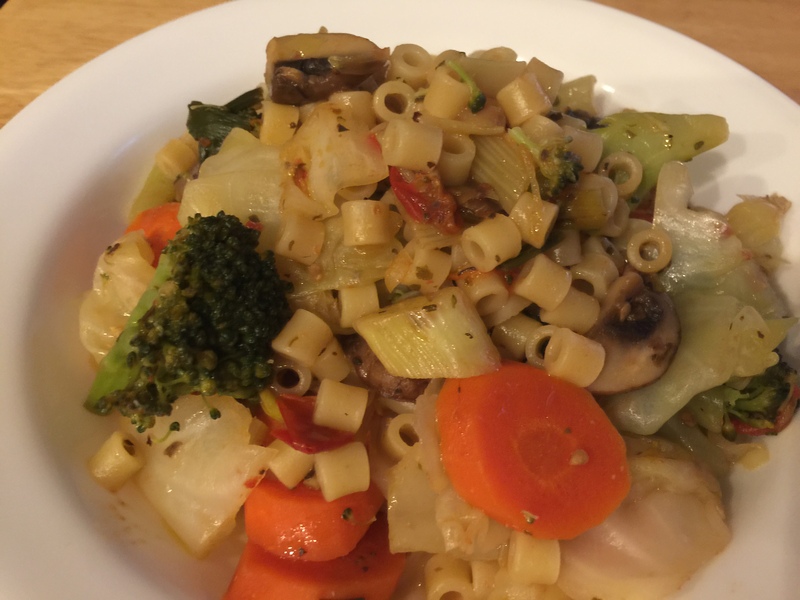 This entry was posted in Pasta, Vegan, Vegetables, Vegetarian and tagged broccoli, cabbage, carrots, Celery, ditalini, garlic, mushrooms, Onions, pasta, tomatoes, Vegan, Vegetables, vegetarian. Bookmark the permalink.